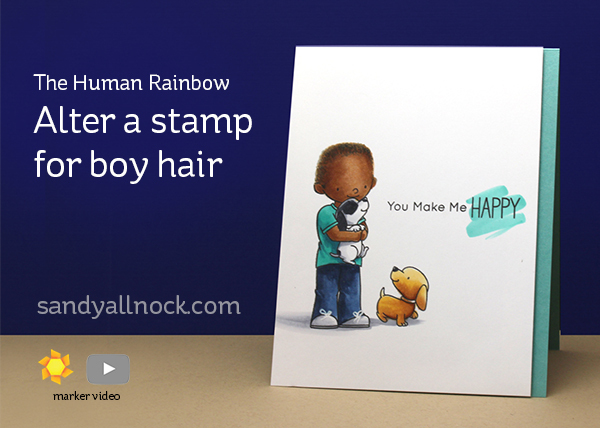 I love to make ethnically0-different cards….celebrating the Human Rainbow! I wanted to turn this little boy into a little African American kiddo playing with Vienna and Giallo (good luck picking up EITHER of my dogs nowadays. LOL)…In addition to the tutorial, I give you some ideas where you can share your cards for others to use because…well, why not? Watch the video below or click HERE to see it in HD on YouTube. Fab card, fab idea with the card suggestions, although I think I require more practice before I inflict my cards on more than my family. Do you know anywhere that I can get a comparison list of Copic no.s and colours to promarker no.s and colours ? I’m trying to get a selection of human rainbow colours tog and am trying to try comparison ‘s. Anyone else reading this have any advice please ? Wonderful card….thanks Sandy for the suggestions! Doing cards for Manor Care (Assisted Living section of the Continuing Residential Care Community where I live), and give all my ‘swap’ cards to a lady in my church that sends to shut-ins, etc. So nice to have these outlets for cards!!! This month one of the card clubs I attend is giving our swaps to the National Guard Armory – they will send them to soldiers from our state so the soldiers have cards to send. 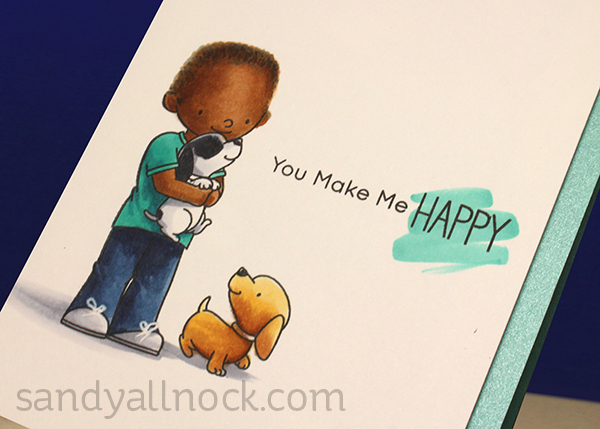 Thankfully the possibilities are endless for places to send our cards…spread the love! That is so so sweet!! This is so great, I love your human rainbow series and always learn something. Thanks for the coloring tutorial; very helpful. My group makes cards for chemotherapy patients at our local cancer center; we try to keep two shoeboxes full for them to peruse and use. If anyone on this site is looking for a place to send your excess cards and/or card fronts (any theme or sentiment or un-sentiment(al)), get in touch! I can refund your postage cost if needed. TIA! I love the human rainbow series. This card looks just like my grandson. Mo Manning is about the only one who makes stamps that look like him! Keep up the diversity. The card is great and your idea for the food bank is just wonderful. I usually make several of the cards instead of just one, then give gift packs away to others that don’t make cards but appreciate hand work. You gave me an idea that the nursing home/rehab center in a nearby town has so many ‘live-ins’ that would appreciate a card to send to someone. Maybe the nurses could display the cards (with envelopes) which residents could select then use. I will get a batch together and take soon and maybe see if a stamp on the matching envelope would be useful, also. Thanks for a great way to use our hobby for kindness. Sandy, thank you for the wonderful idea! I love what you did with the little boy. I only wish there were images out there of people of color. WOW! Really cute card. I also love the technique for changing up the hair. Can you do one for a girl? I would love to see how that would turn out. Adorable card. Love the idea of the food pantry. Thanks for sharing and inspiring us. O M G Sandy ! So cute !!!! Sandy! This is the exact thing I have been contemplating asking your help on! We adopted our fourth daughter from Haiti when she was 10. Her son spends a lot of time with us, we call him our little buddy., and he loves dogs! This stamp is perfect, but I didn’t know how to change the hair. Thank you, thank you! Also thanks for the encouragement to do something with our cards. Sweet card – and great info for changing hair colors and types… I send extra Christmas cards to my step-dad’s nursing home, but for some reason, never thought about a need for cards through the year – thank you for the nudge to do a little more, and have even more fun making cards.